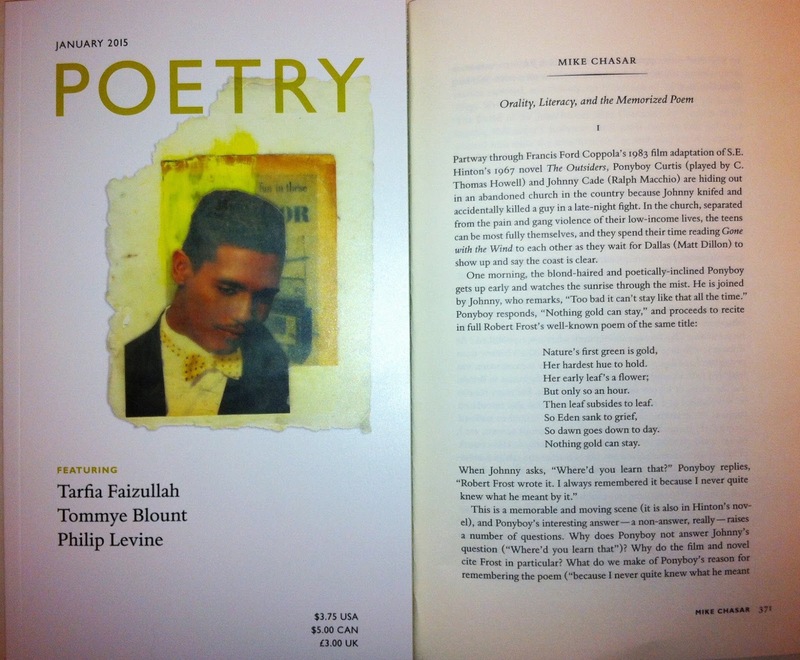 If you pick up your copy of the January 2015 issue of Poetry magazine, you'll find in the monthly "Comment" section an essay titled "Orality, Literacy, and the Memorized Poem"—a piece that P&PC was asked to write in part to reflect on the total coolness of Catherine Robson's great new(ish) book Heart Beats: Everyday Life and the Memorized Poem, which tracks the history and literary and cultural impact of poetry memorization and recitation in British and American schools. You might recall that one of P&PC's favorite writers (and recent National Endowment for the Humanities Fellowship recipient) Melissa Girard reviewed Heart Beats in these very, uh, pages a year and a half ago. To think about Robson's book in a different but related way for the Poetry article, we took a little bit of The Outsiders and a little bit of Robert Frost's recitation of "The Gift Outright" at Kennedy's inauguration in 1961, mixed both with some thoughts about the oral/aural experiences of poetry in non-print media formats, and came up with a piece about how we value poems in relation to what Robson calls "the particular circumstances of [their] assimilation into a culture"—that is, whether we encounter and experience them orally, aurally, in print, or via other media. In an age where poems are circulated and remediated by film, tv, audio formats, and digital platforms of all types in addition to print, the effects of media on poetry—and poetry's effects on media and its audiences—is a conversation in which we love to take part. 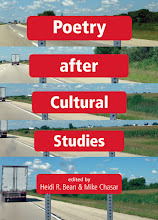 A particular hallmark of popular verse (and of verse encountered in popular contexts) is, after all, its refusal to stay obediently on the printed page of the book or little magazine, and if we're invested in assessing the cultural impact of poetry on a broad scale, we'd do well to extend our attention (and in some cases our admiration) to what poetry is doing in and for non-print media and what non-print media are doing for (and to) poetry. We know you all know this, or that you've at least heard us say it before, so forgive us if we sound a little bit like the metaphorically-apt but nonetheless dated broken record; we're just taking our cues from the larger media landscape and trying to make it new, dig? 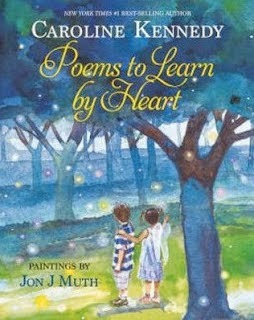 One of the things that Poetry noted when first contacting P&PC about reviewing Heart Beats was the fact that in 2013—a year after Robson's study appeared—Caroline Kennedy published Poems to Learn by Heart, a kid-friendly collection issued by Disney's Hyperion Press and featuring colorful watercolors by Jon J. Muth. 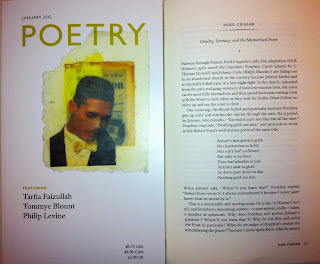 Was this book a sign, Poetry wondered, that poetry memorization was on an upswing? That some cultural nostalgia for days long past was finding new expression? That the age of the internet—fueled in part by things like Disney's "A Poem Is..." video series that premiered during National Poetry Month in 2011 featuring celebrities like John Leguizamo, Jessica Alba, and Owen Wilson reciting poems—was perhaps, unexpectedly and surprisingly, participating in if not prompting this upswing? Unbeknownst to Poetry, Girard was already writing her P&PC piece and had also made the same connection between the Robson and Kennedy books, so how could we ignore that correspondence, coincidental or not, when writing our essay? 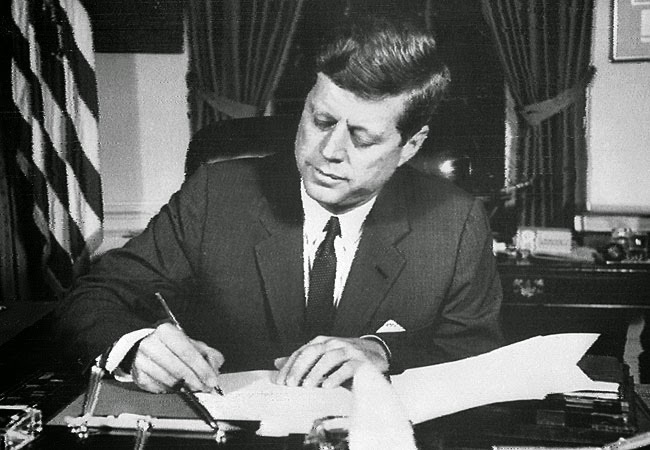 That's when we thought of John F. Kennedy's inauguration and how, flustered by high winds and bright sun, Robert Frost was unable to read the verse he'd composed specially for the event and, instead, recited from memory "The Gift Outright"—perhaps the most famous recitation of a poem in U.S. history and a moment when the values of the memorized poem trumped the values of the printed or written poem on a national stage. 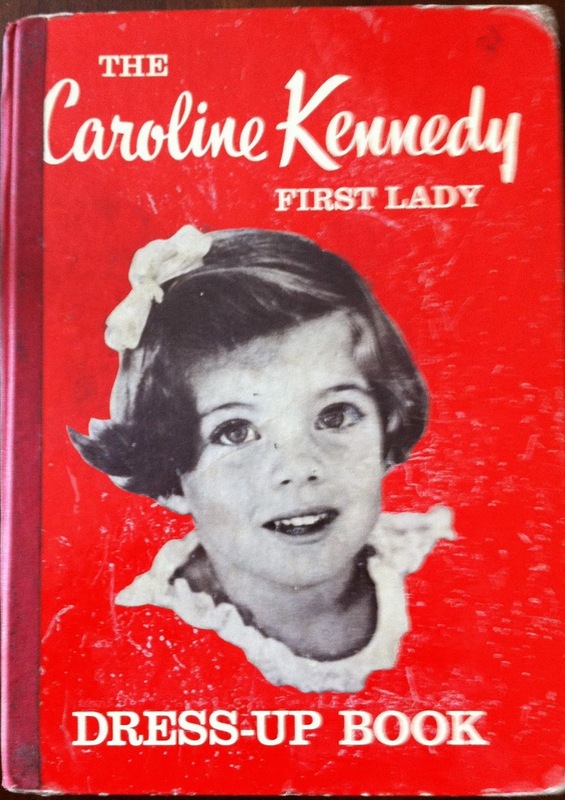 Born in 1957, Caroline Kennedy—the only living child of President Kennedy and current U.S. ambassador to Japan—wouldn't have even been four years old at the time. 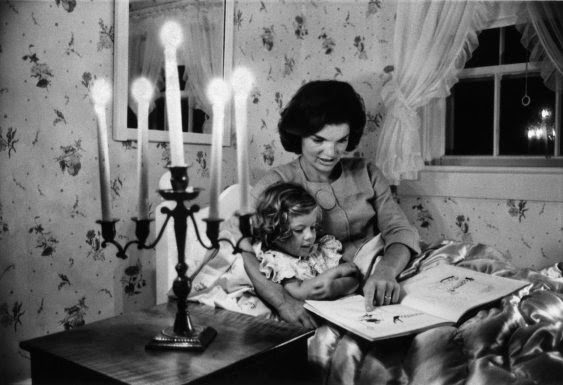 (That's Jackie reading to Caroline in the picture here, taken before 1961 but published by Time on the occasion of Kennedy's inauguration.) But is it possible that something from that day about the durability and reliability of the memorized poem stuck with her? It's hard to say for sure (we haven't yet contacted Caroline's people to ask), but there's no denying Caroline's advocacy for poetry and especially the incorporation of poetry into children's lives where it is often memorized. She has published The Best-Loved Poems of Jacqueline Kennedy Onassis (2001); A Family of Poems: My Favorite Poetry for Children (2005); A Family Christmas, which incorporates poems (2007), and She Walks in Beauty—A Woman's Journey Through Poems (2011), in addition to Poems to Learn By Heart. She hasn't been especially shy about this either. 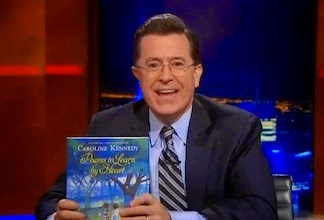 For example, check out her 2013 appearance on The Colbert Report where she plugged Poems to Learn By Heart, explained why one would memorize poems, defended the merits of poetry in the age of Twitter as "the language of the human heart," and along with Colbert did a tag-team recitation of Coleridge's "Kubla Khan" as well as a thoroughly entertaining memorized-poem back-and-forth tennis match with him. 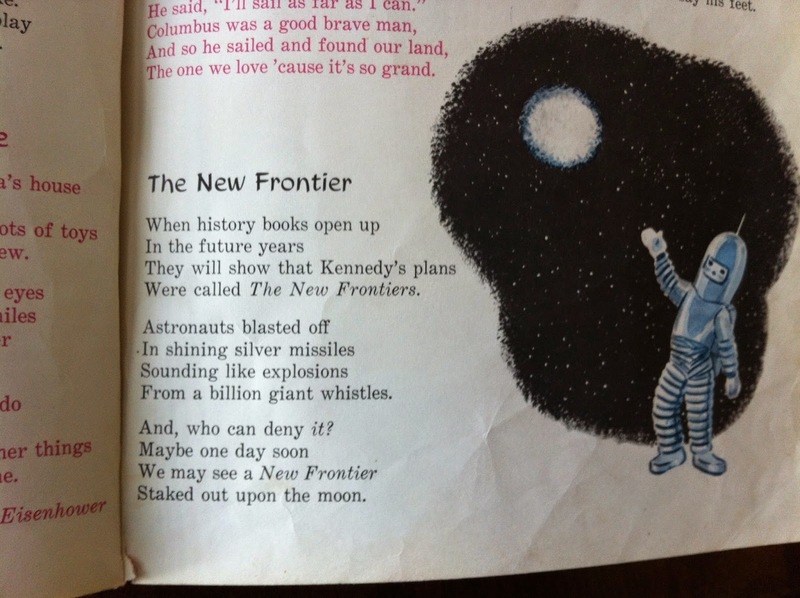 Lest ye think that poetry is a recent, new-millennial interest of Kennedy's, check out the curious book (pictured here) that the P&PC interns got their hands on recently: The Caroline Kennedy First Lady Dress-Up Book, published by Rolton House Publishers in 1963. Illustrated by Charlotte Jetter (whom we think did lettering for Marvel comics in the 1960s and 70s), the book features colored drawings of Caroline dressing up in period-appropriate First Lady attire accompanied by extensive runway-like captions about those costumes. "When I make-believe I am Martha Washington," the first caption in the book explains, "I wear a beautiful eighteenth century gown. It is made of finest taffeta with a big full skirt and a tight-fitting bodice which laces down the back. The material was purchased in London and it is salmon pink in color. The dress is hand-painted with white ribbon chains all over it. Violets, buttercups, daisies and morning-glories are embroidered beside ladybugs, wasps and grasshoppers. I wear a lace cap on my head, lace mitts on my hands and a lace shawl over my shoulders. Don't you think Martha Washington is pretty? I do." But the Dress-Up Book is more than just a fashion show: it's also an anthology of children's poems! Many are little ditties about presidents; others (some written by Alene Dalton) appear to have nothing to do with fashion but are almost cut-and-pasted, scrapbook-like, into the book. 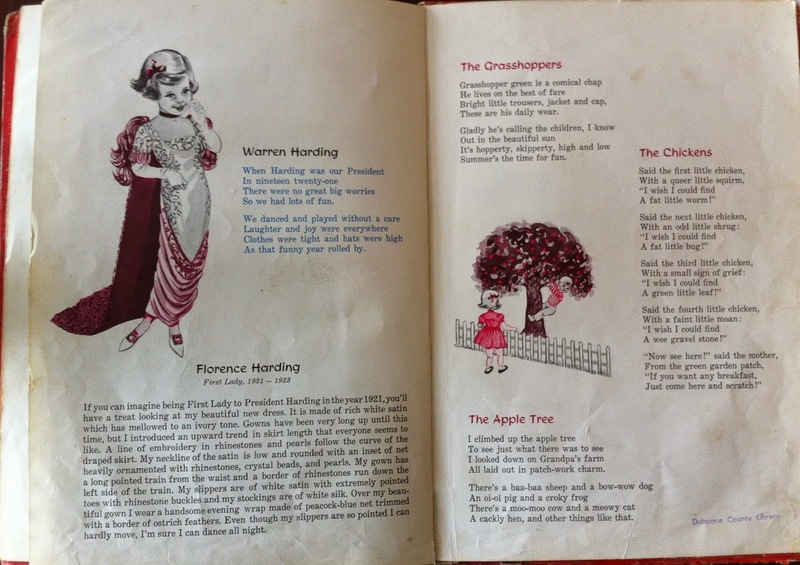 Take, for example, the page-spread pictured here: a picture of Caroline dressing up as Florence Harding, a poem written about "Warren Harding," and three poems ("The Grasshoppers," "The Chickens," and "The Apple Tree" that are linked to each other in theme but that appear to have little or no connection to the roaring twenties, Harding, or a time when "clothes were tight and hats were high." It's kind of a bizarre assemblage—one that connects dress-up play, sanitized versions of history ("We danced and played without a care / Laughter and joy were everywhere," reads "Warren Harding"), and rhymes and metered language. P&PC comes away from it all feeling like childhood, history, and poems are all exercises in pretending and, in the process, poetry emerges from this mix as the language of childhood naivete. Far from the memorized poem, which the grown-up Caroline values for its durability and longevity in the human mind, the verse in the Dress-Up Book appears to feed a discourse in which poetry is the language of childhood—something precious, yes, but ultimately something that we leave behind for the more serious (and prosaic) endeavors of adulthood and "reality." Most of the Dress-Up Book, in fact, is about the past: past presidents, past first ladies, American history, and a fantasy world rooted in farms, apple trees, and ponies. Were called The New Frontiers. From a billion giant whistles. And, who can deny it? Staked out upon the moon. This is the most "adult" poem in the book, one where the activity of dressing-up takes on new and different implications. Here, history is in the making. 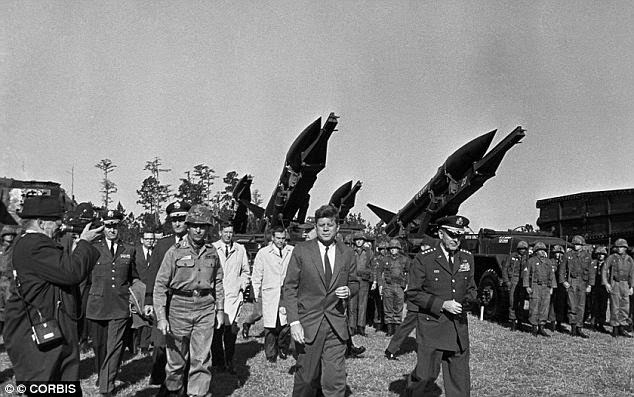 Evoking the space race admits into the Dress-Up Book for the first time the subject of the Cold War, as does the comparison of rockets to "silver missiles" in line six—a line that, months removed from the Cuban Missile Crisis of October 1962, couldn't be read as naive or innocent. Anticipating the moon landing—line 9 even seems to anticipate conspiracy reports denying the landing ever took place—makes this poem about the future, not the past. And even the dress-up taking place here is different; it's a gender-neutral space suit freed from the taffeta, satin, and ruffles of earlier pictures in which all markers of gender are disguised. Boy or girl, you can imagine yourself inside that suit, and it's a moment that caps off a narrative of American history by looking forward from childhood, beyond the corsets of bygone eras, and into new frontiers where pretending (like pretending to be an astronaut) is still in play but leads to actualization—to history making. Even the voice of the poem is different; while retaining the rhyme and meter of previous poems, line 9 contains the only unanswered question in the entire book. There's a much darker side to the history in which the Dress-Up Book is embedded, of course. It was published in 1963, and Caroline's father would be shot and killed in November of that same year—a moment so seared into the American memory that we here at P&PC can't but imagine it in some type of relationship with the history of the memorized poem, the decline of memorizing poems in American classrooms that Robson pegs to the 1960s, the made-up histories in the Dress-Up Book, the loss of American innocence that many people attribute to the moment of Kennedy's assassination, and Caroline's advocacy of poetry memorization now. As Frost demonstrated at Kennedy's inauguration, and as Caroline argues in Poems to Learn by Heart, the memorized poem is always with you and something that—for better or worse—you can't forget.